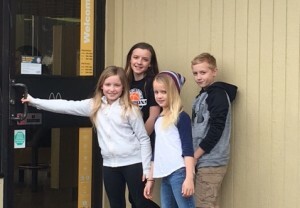 Jessica Melton (Corvallis) wanted her children to experience the power of God and grow in faith so she adopted a strategy she had only heard about but never tried. She and her husband Tom gathered their four children together and had them ask God to reveal to them some details about someone God might want them to speak to. They each prayed and wrote down what they received. “McDonald's” was written down twice, as was “glasses.” One person had written “older man.” Two people independently came up with the name “Clint.” The family piled in the car and drove to McDonald's, where they found an older gentleman with glasses who said his name was Clint. Tom told him that God had him on his mind that day and Clint thanked him warmly. “It was a faith-builder for us all,” said Jessica.